Entrepreneur Scott Alan Turner and his wife Katie have beat the system when it comes to owning cats: They have no litter boxes in their house. In 2006 Scott and Katie decided to eliminate the mess and cost of cat litter in their house by — are you paying attention? — toilet training their cats. You might have heard about it before and thought of a toilet-trained cat as a neat trick or an oddity to brag about to your friends. But have you thought about how much money it could save you? Why Would You Toilet Train a Cat? The average cat owner spends $165 per year on cat litter, according to Kiplinger. Over the life of your cat, that means a savings of $2,000-$3,000. Before training, Scott estimates he was spending about the average on litter for his cat Riker (Star Trek fans?). When he and Katie moved into a 1,200-square-foot townhouse, they added another cat to the family. The rule of thumb is to have one more litter box than you have cats. That means for their two cats, Scott and Katie would have to find places for three litter boxes in their new home. They needed a more creative solution. With some research online, Katie learned about cat toilet training, “but the information was all over the place,” Scott explains. So they decided to take training into their hands. That’s right. This wiley couple not only got two cats to use a human toilet, but they also created and sold a DVD titled “Scoop No More!” with instructions for recreating their success. Because of the advance in internet technology and the hassle of packing and shipping a physical product, the DVDs are no longer available. Instead, you can watch the training for free on YouTube. How do you get a cat out of the box and onto the toilet seat? It involves, in a nutshell, creating a mock litter box to set into the toilet bowl. Gradually, you’ll increase a hole in the middle until your cat is standing on the toilet seat and going directly into the toilet. Commercial cat toilet training systems follow a similar method, but cost around $20 to $50. They also don’t allow for adjustments to meet your cat’s individual needs. “We chose to DIY because the off-the-shelf products [use] fixed increments [to increase the size of the hole],” Scott explains. With their DIY method, you can increase the size of the hole in the makeshift toilet litter box at a pace that keeps your cat comfortable. What About Flushing the Toilet? Scott and Katie also purchased an automatic flusher to install on their toilet. It’s an upfront investment of about $150, but will save you the hassle of flushing after your cat and likely make your bathroom a little bit more welcoming for your family and guests. With the auto flusher, which works just like the ones you see in public restrooms, the toilet flushes as soon as the cat (or a human) uses it. For the couple’s two cats, that means a few extra flushes each day, but they haven’t seen a notable increase on their water bill for it. “Water’s cheap,” Scott points out. Jake and Riker. Image from Scott Turner and Katie Cline. How Long Will Cat Toilet Training Take? The most important “tool” you have to bring to the training process, Scott and Katie say, is patience. Don’t push your cat too fast, and don’t get upset if (when) they have an accident. Instead, reward your cat when they do well, and be prepared for accidents. Keep your cat in a large bathroom or kitchen, for example, that has a linoleum or wood floor that’s easier to clean than carpet or absorbent furniture. 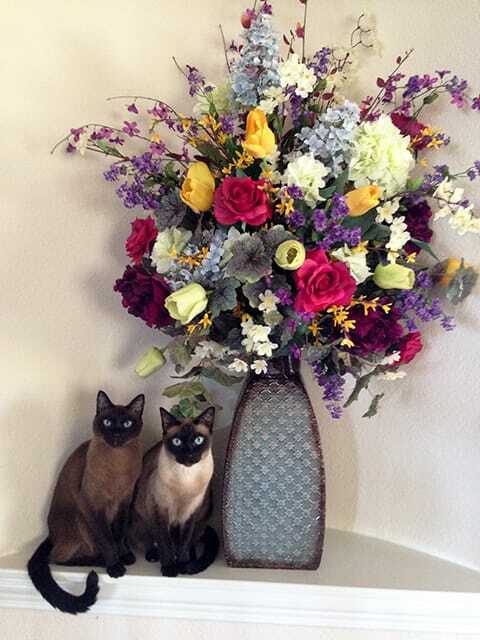 The couple’s cats, Jake and Riker, took about a month and a half to fully toilet train. Jake was a little quicker, Riker a little slower. Some customers report their cats have been able to train in just two weeks; some take up to 12. Younger cats are much easier to train, especially kittens who aren’t yet used to using a litter box. “But cats of any age can do it as long as they’re healthy,” says Scott. You just have to be willing to know and work with your individual cat. And for those who, like me, imagine the biggest challenge for a cat using a toilet would be balancing on the seat, Scott reminds us, “Cats are very agile.” Of course — I should have thought of that! However strange or challenging it may seem, if you’re a cat owner toying with the idea of toilet training, Scott encourages you to go for it. 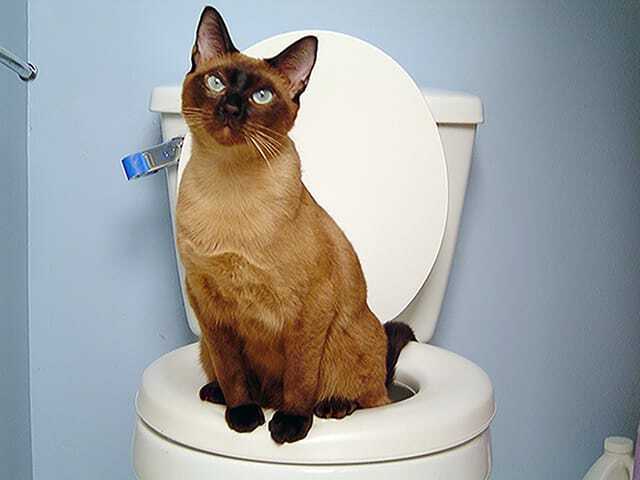 Your Turn: Do you have a cat who is toilet trained? Would you consider toilet training your cat?